FABTECH 2016 – A Great Event for the PFERD Team! Another FABTECH Expo has come and gone, and at PFERD we believe that 2016’s version was a huge success! FABTECH’s importance in the fabrication, welding and finishing industries is reflected in the strong attendance both in number of attendees and in the vast number of geographical markets around the world visitors represented. This year’s FABTECH drew attendees from 120 countries with a total of 31,110 visitors over the three day event. FABTECH gives us at PFERD an invaluable opportunity to meet face-to-face with end users. 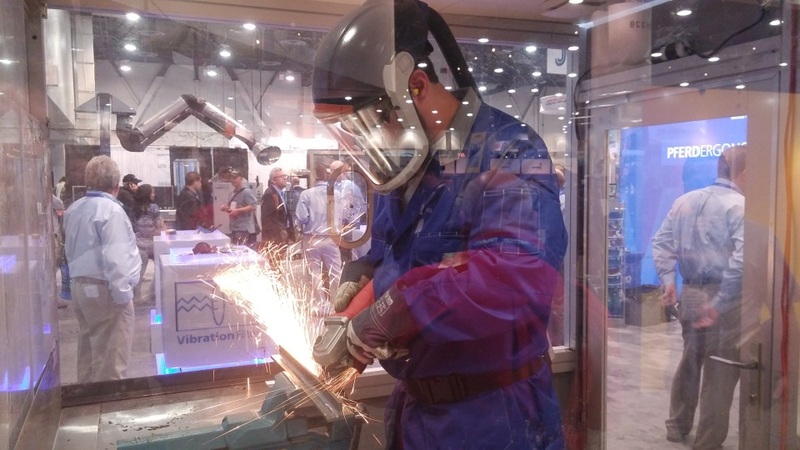 We had several visitors this year that brought their metalworking challenges directly to our booth. Not only does this give us an opportunity to use our expertise to solve problems, but it provides us with an opportunity to see some of the unusual applications our customers deal with on a daily basis. FABTECH is a premier venue for us to highlight the breadth of our portfolio and demonstrate the innovative solutions we bring to users. Unique, innovative products such as our CC-GRIND®-SOLID grinding disc, POLIFAN-CURVE® flap disc and DUODISC® cutting and grinding disc were featured in our grinding booth where visitors saw firsthand how these products perform in true applications, and the benefits these products bring to their everyday tasks. While we are well known for our grinding, cutting and surface finishing applications with hand tools, our brush station gave visitors a first-hand look at our power brush solutions for industrial applications on CNC and robotic machines. Work pieces and videos highlighted deburring applications with our M-BRAD® composite brush portfolio which focused on overall value through optimization of work processes was a primary focus of our message to visitors. The PFERDVALUE® program which highlights how our products and solutions address concerns with operator health and safety, as well as delivering cost savings and productivity increases really resonated with attendees. A fun and interactive way we were able to demonstrate factors such as noise, vibration, haptics and emissions was with our interactive ERGOCUBE displays. 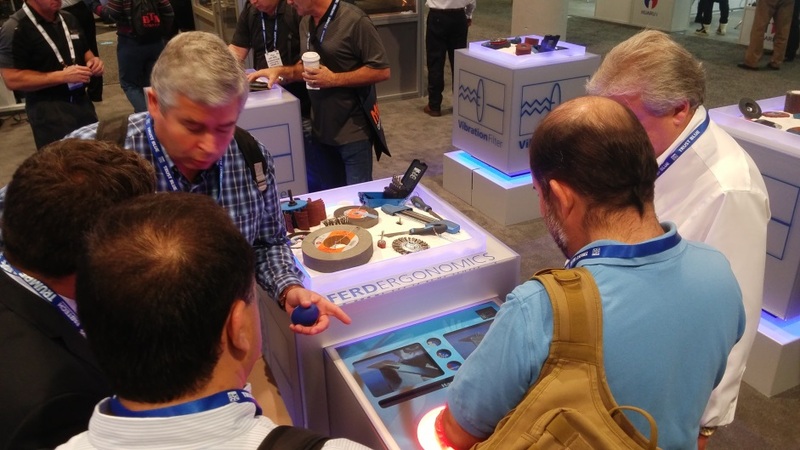 These displays gave a simulated physical experience of how PFERD’s products improve upon these key areas of concern for operators in the metalworking industry. As PFERD is committed to being an innovative, solutions-oriented manufacturer, we look forward to interacting with both current and future end-users at the FABTECH show. It is an annual highlight of the imagination, innovation, and expertise of the PFERD team, and we can’t wait for FABTECH 2017! As we do every year, this year we are once again participating in FABTECH, North America’s largest metal forming, fabricating, welding and finishing event. FABTECH 2015 takes place in Chicago, November 9-12 at McCormick Place, and we’ll be on hand at the four-day show to introduce the newest PFERD products. While they may be new products, the innovative grinding, cutting and surface-finishing tools we’ve added to our catalog provide the same excellent results and the outstanding value PFERD products have been producing for our customers throughout the past two centuries. We’re known for providing single-source solutions for hand finishing, grinding, cutting and specialty applications. FABTECH attendees have the opportunity to preview our new PFERD TM22 tool manual, and can see live demos of PFERD products. The new PFERD TM22 tool manual has enhanced navigational features, in depth technical data references and over 600 new product innovations. The live demos we’ll be hosting at the show will highlight key applications for many of our grinding, cutting and surface-finishing tools. Plus PFERD representatives will be on hand to answer questions and discuss in-depth details about all of our products. The PFERD TOOL MOBILE van service will also be onsite demonstrating how we provide firsthand onsite local training to our customers. Feel free to talk to one of our representatives to learn more about scheduling a visit at your shop location. 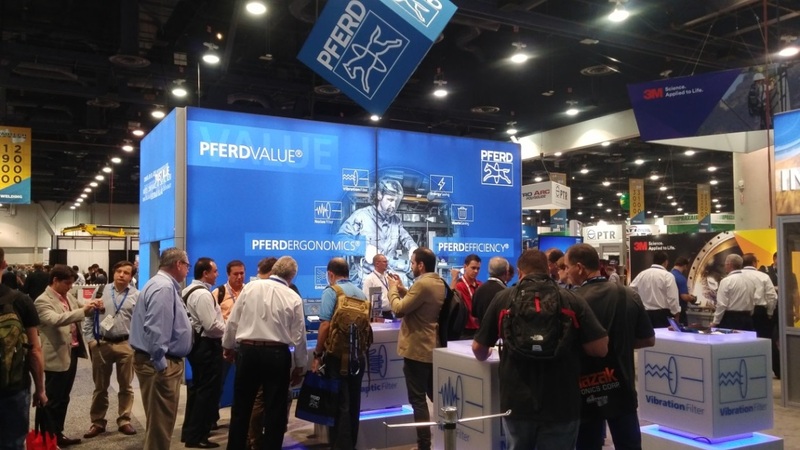 Look for the PFERD team in Booth #N8025 at FABTECH 2015. In the meantime, or if you can’t make it to Chicago, if you have any questions about PFERD products, reach out to us through our website, or give us a call at 800-342-9015. PFERD announces an expansion of the innovative COMBICLICK® Quick Change Fibre Disc system to include surface conditioning, finishing, unitized and felt discs. 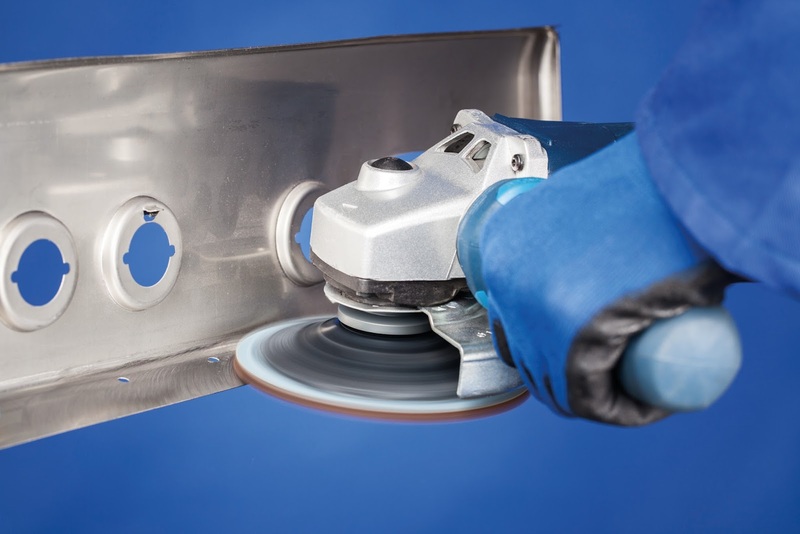 With these new additions, the COMBICLICK® system provides solutions from rough grinding to mirror polishing. COMBICLICK® is designed for use with standard 4″, 4½”, 5″ and 7″ angle grinders. The geometry of the backing pad cooling slots ensures a high throughput of air, thus significantly reducing thermal loads on the abrasive material and workpiece. When combined with a variable speed grinder, the COMBICLICK® system provides more performance and versatility than any other systems available. Benefits include up to 30% lower workpiece temperature, 25% increased stock removal, and 30% longer service life. For more information, email sales@pferdusa.com or visit www.pferdusa.com/combiclick. 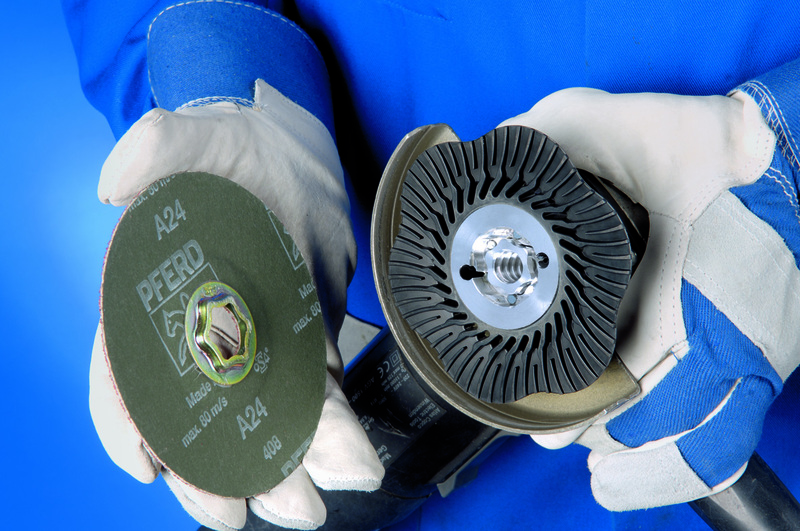 PFERD INC. and PFERD CANADA INC. are North American subsidiaries of August Rüggeberg GmbH & Co. of Marienheide, Germany, a world leader in the design and manufacture of files, quality abrasive products, cutting tools, brushes and power tools since 1799.